Dividers feature five preprinted tabs featuring Monday through Saturday/Sunday. With free templates, you can customize the table of contents page. 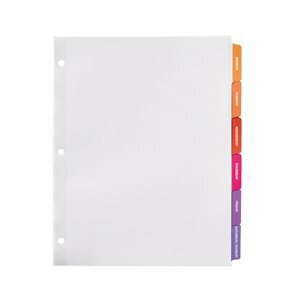 Double sided reinforced binding edge around holes, with extended reinforcement on tabs prevents tearing of tabs from frequent use. For laser or inkjet printers.